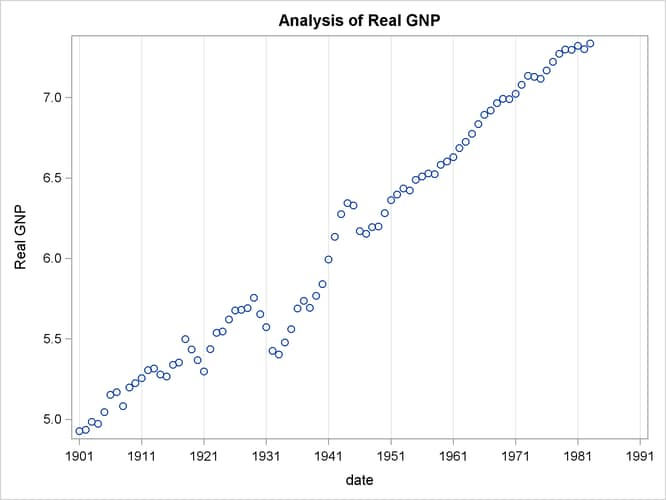 In this example, the annual real output series is analyzed over the period 1901 to 1983 (Balke and Gordon, 1986, pp. 581–583). With the following DATA step, the original data are transformed using the natural logarithm, and the differenced series DY is created for further analysis. The log of real output is plotted in Output 8.1.1.
where is the lag operator. You can observe that the class of a difference-stationary process should have at least one unit root in the AR polynomial . where . The test statistic is the usual t ratio for the parameter estimate , but the does not follow a t distribution. The following code performs the augmented Dickey-Fuller test with and we are interesting in the test results in the linear time trend case since the previous plot reveals there is a linear trend. The printed output produced by the PROC step is shown in Output 8.1.4.